1700 PSI Electric Pressure Washer with Surface Cleaner is rated 4.6 out of 5 by 340. Rated 5 out of 5 by Melbell from Ryobi Product rules. I bought my power washer about 2 to 3 months ago and it was the best investment that I could of done. Ryobi products are amazing anyways and that's why I always stick with it. Great warranties, great products and they always work when you need them too. I also bought the Ryobi air pump for my on the go activities and of course it gets the job done in no time flat. I'm like a kid in the candy store every time I go to the Ryobi section of the store. I always end up buying something Ryobi. The power washer is in my opinion just as good as the gas and oil ones. Gets the job done just as fast and if not better. Keep up the good work with the Ryobi product. Rated 5 out of 5 by Lloryck from Super easy residential pressure washer. I have a Trex composite deck. I also have Oak trees. The deck is on the north side of the house. This means I get schmutz from the trees. Moss from being in shadow too much... and a bird feeder which brings additional deposits. It's been 4 years since the last cleaning which was done over 2 days using brushes and buckets. With the Ryobi 1700psi we did it in 4 hours ( 32 x 14 deck ) using a spray bottle of Simple Green (to loosen the grime) and the 11 in surface attachment, it was a breeze. The best part.... my wife wanted to do it all! Well she did let me squirt some stuff! Solid piece of equipment. I'm happy I bought it. BTW it's nowhere near as loud as a gas pressure washer. Rated 5 out of 5 by Jimbo2 from Perfect for the Price I bought this a few weeks ago as my old one broke down. The price was right and I needed it quickly. I love all the features on it compared to my old one. It is much easier to set up and take down. In Portland we are getting a lot of smoke and ash from the forest fires around us. My pickup is sitting on the street and covered with the ashes the wind is blowing in. The Ryobi Pressure Washer is perfect for cleaning all the forest fire ashes off my pickup. It did an excellent job. I used it to clean my cedar deck off so I could stain it. I highly recommend this product for general around the house use. Rated 4 out of 5 by 97420 from Does most jobs well My wife purchased this for me as a birthday gift because I had told her that our house really needs a good exterior wash every year. I told her that I didn’t want to deal with gasoline anymore, so electric was the way to go. This works prettt good, however we have a 2 story and it doesn’t really work for that, despite any modifications I have bought. The surface washer is good for light duty, such as driveway cleaning; unfortunately it was no match for our mossy back patio. I had to remove the surface washer and use the concrete “massage jet” attachment for good results. Rated 5 out of 5 by JawshPardee from Fantastic unit and fun too! I had no idea that my drive way and entry stoop were as dirty as they were before I used the pressure washer to clean them! The washer is simple to set up and even easier to use - in fact, my daughters (both under 10) also had a blast blasting the dirt and grime away from our backyard deck. All told, the washer worked well for over 2 hours of straight use and my concrete and wooden deck are positively gleaming! My only very minor complaint is that I had to bend over slightly to get the tip of washer’s gun at an adequate distance for optimal washing, otherwise it’s superb. Rated 4 out of 5 by Marcus S from Needs an adjustable spray pattern tip nozzle. I recently purchased this machine to replace my old (brand X) pressure washer which was destroyed by hurricane Irma. My old washer had a wand with a built on variable spray pattern tip nozzle which made it very convenient, both quick and easy to adjust the spray pattern without having to change the nozzle itself. I was disappointed to see that this unit does not have that feature. 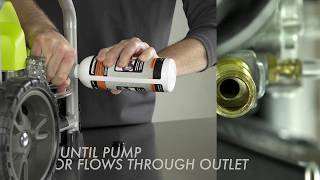 This would be a quick and easy fix for Ryobi to include that type of variable spray pattern nozzle or at least make it available as an accessory that you could purchase separately. As long as you don't mind taking the time to change nozzles and still have limited spray patterns, this is a great little unit for the money and I would recommend it! Rated 5 out of 5 by Seosamh from Good fit for home use. I really like my Ryobi electric pressure washer. I does a good job on my pool deck and driveway. I purchased the electric pressure washer from Home Depo. It came with the recommendation for the EZ 12" Surface Cleaner. I was not aware Ryobi had a surface cleaner at the time. I was a little disappointed in the EZ 12" Surface Cleaner that I purchased. I have used better surface cleaners than the EZ. Rated 5 out of 5 by joulesMI from great bang for the buck I am very happy with this product. was very easy to use, I loved the quick switch tips. I powerwashed my home and windows and then took it to my mothers and did her windows and cement patio. worked great. It is not however a "professional" pressure washer, so if you have a really filthy house to clean up you will need more pressure. but for every year cleaning this is perfect. The Ryobi 1700-PSI Pressure Washer is engineered to handle even your toughest jobs. With a powerful 13 Amp Electric Motor, this Ryobi Pressure Washer delivers 1700-PSI of force and comes with an 11 in. Surface cleaner, to knock out those large cleaning projects faster. Featuring a durable and compact roll-cage frame design this pressure washer is designed for easy transport. The On-Board Detergent Tank offers hassle-free cleaning by eliminating the need to drag a bucket and hose behind you. For added convenience, the Ryobi 1700-PSI Pressure Washer is equipped with on-board accessory storage and a bonus Turbo Nozzle for up to 50% more cleaning power. The Ryobi 1700-PSI Electric Pressure Washer is backed with the Ryobi 3-year limited warranty and is guaranteed to deliver results for years to come.